A close friend or relative is getting married—and you are throwing a bridal shower. For some women, nothing delights them more than to begin the bustle of party planning, while others absolutely dread it. Wherever you fall on the celebration spectrum, showers can easily become very expensive. Never fear, however! You can absolutely find easy ways to help you learn how to throw a bridal shower on a budget – here are 12 ways to try. The easiest way to save money and your sanity is to split the responsibility of throwing a bridal shower with other people. If the bride has bridesmaids, that’s a great place to start. Simply reach out to them and let them know you’d appreciate their help with the shower. You can assign specific tasks such as creating invitations and planning party games, or you can simply ask for monetary contributions. Other people who are probably more than willing to help include the mother of the bride and the mother of the groom along with any other close relatives or family friends. 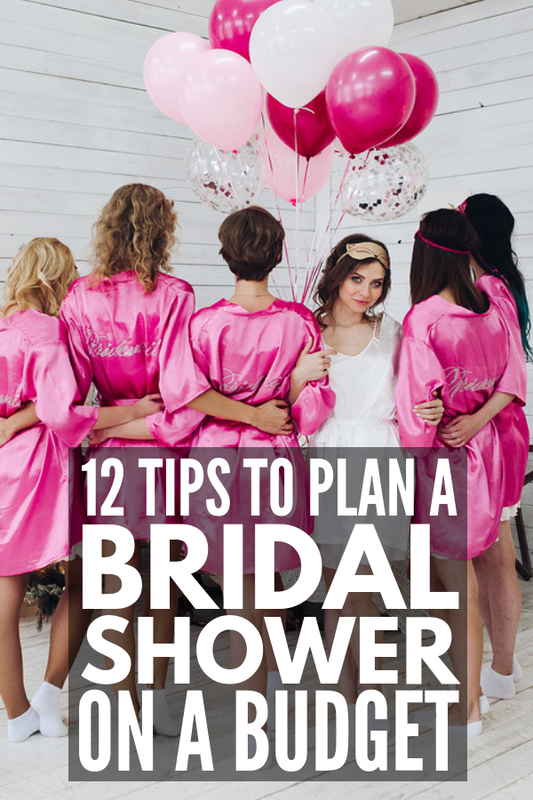 Throwing an event like a bridal shower at home is practically guaranteed to save you money. Rather than paying to rent a venue and cater or order food and drinks, you can simply host in your space for free. If your home isn’t a great option, you can ask bridesmaids or family friends if they would be willing to host as well. If you are in a mild climate, hosting a backyard event will provide plenty of natural decor, plus space for children to run and play. Make sure you have seating for anyone who will likely need it such as elderly guests or pregnant women. Another easy way to save money on a bridal shower is to choose the time of your event carefully. Don’t throw your shower at a time when people would expect you to feed them an entire meal, like from 11am-1pm or 6pm-8pm. Instead, opt for an afternoon shower around 3 pm in between lunch and dinner where you can serve light snacks rather than entire meals. Go through the guest list with a fine-tooth comb. Does everyone really need to be on the guest list? If you have a list filled with acquaintances rather than true friends, consider the idea of leaving them off the guest list. You can also look for people who will be present at another shower, like coworkers of the bride. If they are already throwing her a work shower, she does not need her entire department at this event as well. To spare any hurt feelings, you can always let people know that physical space was limited, or that the bride wanted to keep it to close friends only. Years ago, many people considered it bad form to send anything other than mailed paper invites. Thankfully, the Internet has become a daily part of virtually every life, and there are very few people who would think anything of it to receive a shower invitation digitally rather than in their mailbox. Paperless Post. This digital invite company has nearly 400 options for bridal shower invitations alone. Nearly every style is represented from bold and modern to whimsical hand-drawn flowers. The invitations are customizable—you can change the language on each and many offer further options such as adding a photograph of the bride. There are both free and paid options. Evite. Another way to send digital bridal shower invitations is through Evite. They also offer both free and paid selections, and you can add a custom image to several. If you have a theme in mind for the shower, you can narrow down the dozens of Evite options by theme type such as brunch or floral. Green Envelope. If you’d like custom digital wedding shower invites, Green Envelope should be on your list of company’s to look at. While there are no free options (you pay on a sliding scale based on the number of mailings), the features make up for it to many people. You can play music, integrate photos, add gift registry information and area info like hotels and things to do in the area. Whichever digital invite option you select, you will save money, stress and time. Rather than running to the post office to purchase stamps or tracking responses by hand, you can invest that time and energy into something else for the shower. Utilize online stores like Amazon to price items and ensure you are getting the best deal possible. If you have Amazon Prime, take advantage of the free two-day shipping and watch the savings start to add up. You can use an online plugin like Honey which will track pricing and find cheaper options for the same items when available, or Ebates to earn rebates on eligible purchases, which you can re-invest into shower supplies. This bridal paper plate set includes coordinating napkins and cups as well as silverware – easy peasy! If you’ll be serving light food and snacks at the shower, you can save a good deal of money by purchasing from a membership-based warehouse like Sam’s Club, Costco, or BJs. Stock up on items such as a sandwich or veggie tray, chips and dips, sodas and water, and (if you are serving it) wine and beer. Some locations even have liquor available! Make sure you check the frozen food aisles for bite-sized foods like mini quiche or sweet treats like macarons. If you are serving cake or cupcakes, these clubs can be a great place to get a massive amount of customized dessert on the cheap as well. Just make sure you order a week or so ahead of time! Whether or not you implement this tip about how to throw a bridal shower on a budget depends on the bride herself. For some brides, a glass of champagne is a necessary ingredient to a great shower, while others do not drink at all. Know thy bride and plan accordingly. Another idea is to consider serving the bride’s favorite beverage as a signature drink rather than multiple options. This doesn’t necessarily need to be alcoholic—it could be mint iced tea, or lavender lemonade if that’s what she likes! Just make sure there are non-alcoholic options available too—it could be as simple as iced tea or flavored water. First of all, know that favors aren’t absolutely necessary to have at your shower. Many people forgo favors altogether or only provide them for children. Additionally, many people will opt not to take a favor home if offered one. If, however, favors are necessary, they can be scaled down tremendously. Try your hand at making something guests can take home such as a DIY hand scrub station with empty jars where guests can package their own scrub to take home. Or, you can grab some mini vases and fill them with flowers or succulents, and use them to decorate around the shower. At the end of the afternoon, encourage guests to grab their favorite one on the way out. If you choose to do games at the bridal shower, they do not need to be elaborate affairs with expensive prizes. Instead, you can gift the winner with a small item like a $5 Starbucks gift card in a cute mug, or a bottle of nail polish in a pretty color. Lastly, if you are throwing a shower for a bride, you obviously have some ties with her. Rather than feeling coerced into purchasing an expensive gift for her, opt for something that highlights your history together and make something meaningful she would love. There are endless possibilities—you could create a handmade sign with her new last name, sew her a cute zippered pouch to keep her new lingerie in with a sentimental note full of inside jokes tucked inside or dogsit her beloved pet while she is off on her honeymoon. Remember, at the end of the day, a shower is about making a bride feel loved and celebrated, not a contest about how much money you can spend. Cheers! If you found this collection of tips to teach you how to throw a bridal shower on a budget helpful, please share this post on Pinterest! And if you’re looking for more tips and ideas to help you get wedding ready, check out our Beauty board where we share all kinds of great ideas we find each day!